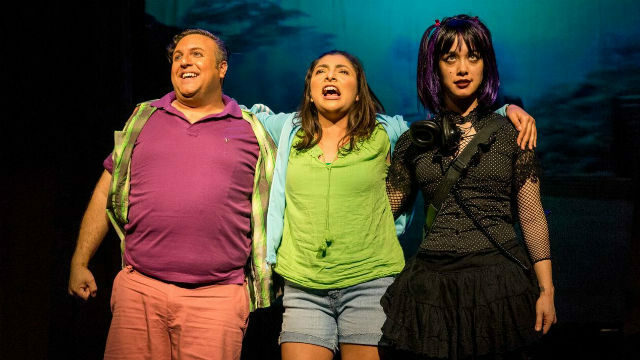 Bryant Hernandez, Kenia Ramirez and Jennifer Paredes, three friends on a mission, in “Into the Beautiful North” at the San Diego Repertory Theatre. I fell in love with the writing of Luis Alberto Urrea when I read “The Hummingbird’s Daughter,” which inspired me to devour “Into the Beautiful North,” his 2009 quest novel set in Mexico, San Diego and Kanakee, Illinois. “Beautiful North” didn’t have the elegance or magical realism of “Hummingbird,” but it was filled with humor and whimsy. The novel won acclaim and was selected by the National Endowment for the Arts Big Read program, and is being developed as a series for TNT. Now, as part of the National New Play Network, the San Diego Repertory Theatre is the first of several hosts of a rolling world premiere of a stage version of “Into the Beautiful North,” written by Karen Zacarías, who is binational like Urrea (he was born in Tijuana, raised in the South Bay and Clairemont, and educated at UC San Diego). Though director Sam Woodhouse said, in his curtain speech, that he’s been involved with the piece for the past year, it still feels very much like a work in progress. Whereas Urrea’s prose is elegant, fanciful and funny, this production is silly and amateurish. Instead of deftly drawn, multi-dimensional characters, we get cartoonish caricatures. Sly and subtle humor has given way to very broad strokes, stock characters and slapstick. It feels like a summer camp pastorela. The ensemble is working hard, malleably creating myriad characters, but some make only momentary appearances and not all serve a purpose or make a point, though Mexico-phobia and homophobia feature prominently. As in any odyssey, the hero (heroine, in fact) is confronted by — and surmounts — many obstacles. She is met by both cruelty and unexpected generosity. Her friends, both new and old, prove resolutely loyal. Urrea’s Nayeli is a terrific creation: a feisty 19 year-old who’s strong, athletic (a brown belt in karate, though her onstage moves do not convince), but still innocent and relentlessly, contagiously optimistic. Growing up in a poor Sinaloan village, Tres Camarones, 1,000 miles from the U.S. border, Nayeli was abandoned by her father at an early age. Like that absent dad, the rest of men have decamped for The Beautiful North. The town is dying , yet narco-traficantes are threatening to take it over. In the play, the reason for this is never clarified, but the book explains that the banditos are drawn to the drug-buying American surfers who frequent the nearby beaches. After viewing the movie classic, “The Magnificent Seven,” about a small Mexican town terrorized by a bandit but saved by U.S. gunmen recruited to defend it, Nayeli decides to embark on a mission. She’ll travel to America, find her father and bring back her own Seven Magnificent Hombres, Mexican men who will repopulate and protect the town (and maybe even provide her with a boyfriend — though she’ll also be looking up a blond Mormon who’d been on his mission in Tres Camarones and has since decamped to San Diego). “It takes a great woman to find a somewhat okay man,” her feminist aunt instructs her. Her partners in crime (they cross the border illegally — twice) are her black-clad, Goth bestie, Veronica, who now goes by Vampi (as in Vampira), and her high-spirited gay confidant, Tacho. (In the book, there was a fourth musketeer, Yolo, an A-student revolutionary girl). After a long and harrowing bus trip, they arrive in Tijuana, and meet the wacky Atomiko (hunky and hilarious Jorge Rodriguez, who also appears, amusingly, in Nayeli’s dreams as Johnny Depp’s piratical Captain Jack Sparrow). Border Patrol agents good and bad, and a truckload of helpful and hurtful encounters facilitate the fulfillment of their mission — and then some. The trio even tracks down the old bowling beau of Nayeli’s fierce and forceful Tia Irma (Catalina Maynard), who’s just been elected the first female Mayor of Tres Camarones. (clownishly inhabiting mostly stock characters we’ve seen him play before). Cactus, road signs and scenery roll by on a turntable, backed by illustrative videos (scenic and projection design by Ian Wallace). Events and characters also fly by, though the plot seems to proceed slowly, there’s way too much narration, and the songs (original music and soundscape by Michael Roth) detract rather than add, and are not particularly well executed. Still, as the merry triumvirate, Kenia Ramirez (nice-kid Nayeli), Jennifer Paredes (funky Vampi) and Bryant Hernandez (prissy Tacho) are engaging. The sound (Matt Lescault-Wood), lighting (Lonnie Alcaraz), and costumes (Jennifer Brawn Gittings) are effective, but this piece and production have a long way to go to make the North — and its southern neighbor — beautiful.